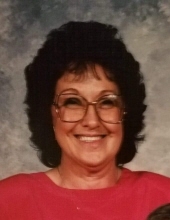 Vicie ‘Maxine’ Terry, 85, of New Carlisle, Ohio, passed away January 13, 2019, with her family by her side. She was born to the late Richard and Grace (Johnson) McIntosh, March 18, 1933, in Jett’s Creek, Kentucky. Maxine received her GED in 1980 at the age of 47. She attended Grace Bible Community Church. She loved to read her Bible, write prayers, crochet, and quilt. She married the late Roger Terry in 1948 and celebrated 66 years together. Maxine is survived by one daughter: Vicky (Elmer) Davis, of New Carlisle, Ohio. She is also survived by grandchildren: Vickey (Brad) Spencer of Springfield, Ohio; April (Chad) Estep of New Carlisle Ohio; Daniel (Kimberly) Terry of Irvine, Kentucky; Roxanne (Maverick) Reynolds of Science Hill, Kentucky; and great-grandchildren: Kendall Spencer, Brayden Spencer, Kelsey Spencer, Maycie Estep, Crew Estep, Matthew Terry, Ryan Terry, Brooklyn Reynolds, and Jocelyn Reynolds. She is survived by two sisters: Margie McIntosh Barrett and Wanda McIntosh Phelps. Maxine was preceded in death by her loving husband in 2014; three sons, Leonard William ‘Bill’ Terry (2013), Rickey Terry (1983), and Gary Terry (1993) and brothers and sisters. Maxine was a devoted mother and wife. She passionately loved the Lord and left a legacy of praying and living for God. As her health declined and she became unable to communicate, one could find her listening and 'singing' with her eyes to gospel hymnals. She loved to listen as her daughter Vicky read the Bible and Daily Devotions to her. Her faithfulness was a testimony to all who knew her. Viewing ceremony will be held on Thursday, January 17 at 11 a.m. with a Celebration of Life at 1 p.m. at the Breathitt Funeral Home in Jackson, Kentucky. The burial will take place following the service at the Terry Family Cemetery. To send flowers or a remembrance gift to the family of Maxine Terry, please visit our Tribute Store. "Email Address" would like to share the life celebration of Maxine Terry. Click on the "link" to go to share a favorite memory or leave a condolence message for the family.